The somatosensory pathway is composed of three neurons located in the dorsal root ganglion, the spinal cord, and the thalamus. A somatosensory pathway will typically have three neurons: primary, secondary, and tertiary. The cell bodies of the three neurons in a typical somatosensory pathway are located in the dorsal root ganglion, the spinal cord, and the thalamus. A major target of somatosensory pathways is the postcentral gyrus in the parietal lobe of the cerebral cortex. A major somatosensory pathway is the dorsal column–medial lemniscal pathway. The postcentral gyrus is the location of the primary somatosensory area that takes the form of a map called the sensory homunculus. parietal lobe: A part of the brain positioned superior to the occipital lobe and posterior to the frontal lobe that integrates sensory information from different modalities and is particularly important for determining spatial sense and navigation. reticular activating system: A set of connected nuclei in the brain responsible for regulating wakefulness and sleep-to-wake transitions. postcentral gyrus: A prominent structure in the parietal lobe of the human brain that is the location of the primary somatosensory cortex, the main sensory receptive area for the sense of touch. A somatosensory pathway will typically have three long neurons: primary, secondary, and tertiary. The first always has its cell body in the dorsal root ganglion of the spinal nerve. 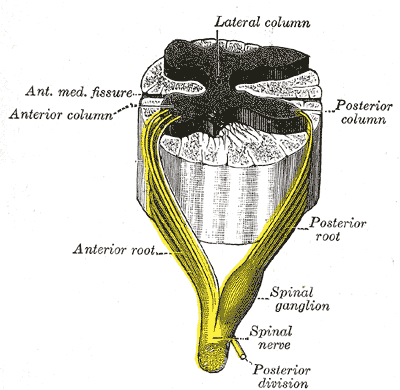 Dorsal root ganglion: Sensory nerves of a dorsal root ganglion are depicted entering the spinal cord. The second has its cell body either in the spinal cord or in the brainstem; this neuron’s ascending axons will cross to the opposite side either in the spinal cord or in the brainstem. The axons of many of these neurons terminate in the thalamus, and others terminate in the reticular activating system or the cerebellum. In the case of touch and certain types of pain, the third neuron has its cell body in the ventral posterior nucleus of the thalamus and ends in the postcentral gyrus of the parietal lobe. In the periphery, the somatosensory system detects various stimuli by sensory receptors, such as by mechanoreceptors for tactile sensation and nociceptors for pain sensation. The sensory information (touch, pain, temperature, etc.,) is then conveyed to the central nervous system by afferent neurons, of which there are a number of different types with varying size, structure, and properties. Generally, there is a correlation between the type of sensory modality detected and the type of afferent neuron involved. For example, slow, thin, unmyelinated neurons conduct pain whereas faster, thicker, myelinated neurons conduct casual touch. In the spinal cord, the somatosensory system includes ascending pathways from the body to the brain. One major target within the brain is the postcentral gyrus in the cerebral cortex. This is the target for neurons of the dorsal column–medial lemniscal pathway and the ventral spinothalamic pathway. Note that many ascending somatosensory pathways include synapses in either the thalamus or the reticular formation before they reach the cortex. Other ascending pathways, particularly those involved with control of posture, are projected to the cerebellum, including the ventral and dorsal spinocerebellar tracts. Another important target for afferent somatosensory neurons that enter the spinal cord are those neurons involved with local segmental reflexes. Spinal nerve: The formation of the spinal nerve from the dorsal and ventral roots. The primary somatosensory area in the human cortex is located in the postcentral gyrus of the parietal lobe. This is the main sensory receptive area for the sense of touch. Like other sensory areas, there is a map of sensory space called a homunculus at this location. Areas of this part of the human brain map to certain areas of the body, dependent on the amount or importance of somatosensory input from that area. For example, there is a large area of cortex devoted to sensation in the hands, while the back has a much smaller area. Somatosensory information involved with proprioception and posture also target an entirely different part of the brain, the cerebellum. This is a pictorial representation of the anatomical divisions of the primary motor cortex and the primary somatosensory cortex; namely, the portion of the human brain directly responsible for the movement and exchange of sensory and motor information of the body. Homunculus: Image representing the cortical sensory homunculus. The thalamus is a midline symmetrical structure within the brain of vertebrates including humans; it is situated between the cerebral cortex and midbrain, and surrounds the third ventricle. Its function includes relaying sensory and motor signals to the cerebral cortex, along with the regulation of consciousness, sleep, and alertness. Thalamic nuclei: The ventral posterolateral nucleus receives sensory information from the body.